Living in the area that I do, there are a fair number of pretty good establishments serving Mexican food. 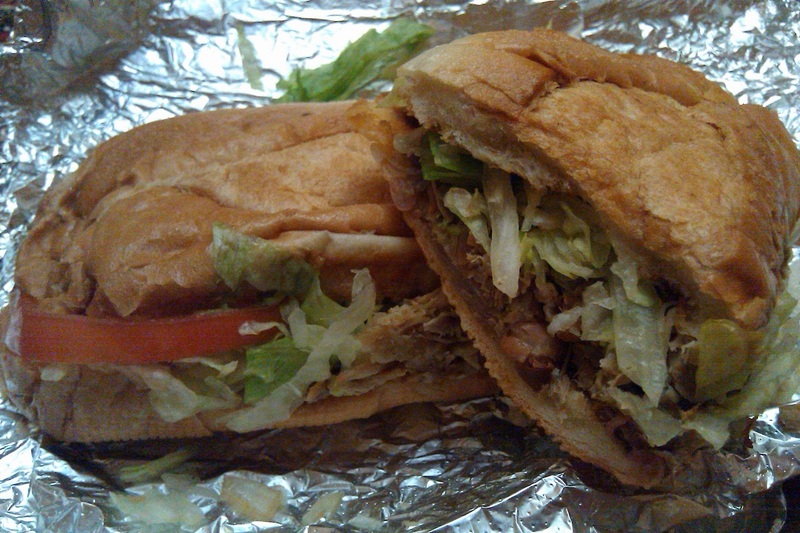 And the torta, as a class, is a pretty good sandwich. (I’ve previously covered tortas here here and here, though the best I’ve ever had was in Phoenix, not California.) So the combination of two things that are good more often that not gives you a really good shot at getting a sandwich you know will excel. Sadly, La Victoria managed to slip through that narrow window with this disappointing offering. La Victoria’s claim to fame is their orange sauce, a creamy hot sauce that is everything its reputation promises. It is obscenely good, and a healthy dose of it made sure this sandwich was tasty enough. But beyond the sauce, there just wasn’t much there. There was a thin roll, a handful of iceberg lettuce, a few slices of tomato, and a helping of carnitas that might best be described as just on the friendly side of acceptable. If there was avocado in there, it was doing its best to hide from me. Maybe it’s that Northern California Mexican cuisine is ruled by the burrito, and in many cases the torta appears on the menu as an afterthought. Perhaps La Victoria thought they could skate by on what is admittedly superb sauce, and they just didn’t pay their torta much mind. Well that’s too bad, because even simple sandwiches deserve an honest effort, and the people who eat them deserve a better sandwich than this. This entry was posted in Sandwich Reviews and tagged Pork, Reviews by Pete, San Jose, Torta by Pete. Bookmark the permalink.